Plug-in LED Night Light Lamp with Light Sensor 6-Pack DEAL! Plug-in LED Night Light Lamp with Light Sensor Automatic On / Off 6-Pack DEAL! Need night lights that turn on and off with light sensors? Hurry and get the WEDNA 0.5W Plug-in LED Night Light Lamp with LDR Sensitive Light Sensor Automatic On / Off, Ideal for Bedroom, Bathroom, Hallway 6-Pack (Round) today for only $5.99 from Amazon! That’s only $1 each night light!! Plus, the average customer rating is 4.5* out of 5! Energy Conservation – Save money on energy and bulb replacement. The nightlight uses 4pcs super bright LED, no bulb replacement. Low power energy saving lamp. These night lights offer a continuous glow for added safety, security, and convenience. 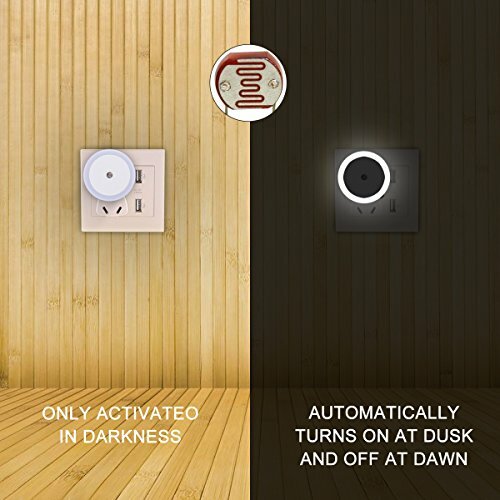 All you have to do is plug-in wall power outlet and the night light will automatically turn at night and turn off at dawn. You will never fear the darkness, the product can also help soothe your mood. It is great for children’s bedroom, living rooms, hallways, entrance ways, and more. Portable mini size, can be flexibly carried to anywhere for convenient use. Smart Energy-Saving, 0.5W Plug-in Led Night Lights and put them around your house. Buy the WEDNA 0.5W Plug-in LED Night Light Lamp with LDR Sensitive Light Sensor Automatic On / Off, Ideal for Bedroom, Bathroom, Hallway 6-Pack (Round) from Amazon. Previous articleMen’s Swim Trunks – as LOW as $2.88! Many Styles & Colors! Next article15 Awesome Hard Boiled Egg Recipes including Avocado Egg Salad!